Shocking photos show Swedish Minister of Culture celebrating with "n*g*er cake"
Politik.A macabre scene with racist undertones took place on Saturday when Swedish minister of culture Lena Adelsohn Liljeroth attended a tax funded party for the Stockholm cultural elite. 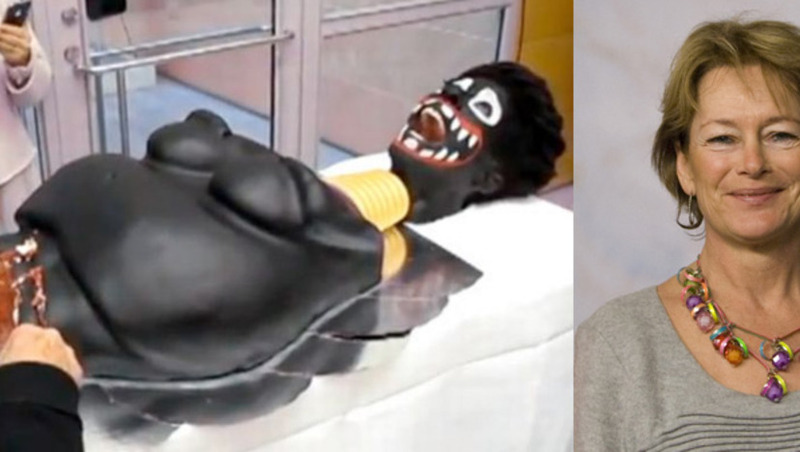 The self-proclaimed "anti-racist" Liljeroth declared the party officially started by slicing a piece of a cake depicting a stereotypical African woman. Photos from the party at World Art Day have already been released on Facebook and are now going viral in social media. The shocking photos show several established left-wing members of the Stockholm cultural elite watching and laughing as Minister of Culture Lena Adelsohn Liljeroth slices a cake depicting a black African woman with minstrel-esque face. Lena Adelsohn Liljeroth was invited to open the festivities by performing a clitoridectomy on the cake, which she did by slicing off the part of the cake depicting female genitalia. She then proceeded to feed that part of the cake to a performance artist, done up in blackface, his head protruding through the table. The body screams every time someone slices a piece. The events that unfolded at the party stand in stark contrast to Lena Adelsohn Liljeroth's official political posititions. Publicly she advocates a strict hard-line approach against racism. When in 2010 the Swedish nationalist newspaper Nationell Idag managed to acquire enough subscribers to qualify for state-funded press subsidies she immediately took action to change the country's press subsidy laws. - It is distasteful to support extremist newspapers, Lena Adelsohn Liljeroth was quoted as saying in the government publication Riksdag & Departement, promising measures to deprive newspapers with "racist" content of press subsidies. - Although this is a question of freedom of expression, we dont want taxpayers' money to support this form of media, she further noted. Why government funds should be used to pay for cakes such as the one served last weekend, has yet to be explained by Liljeroth.